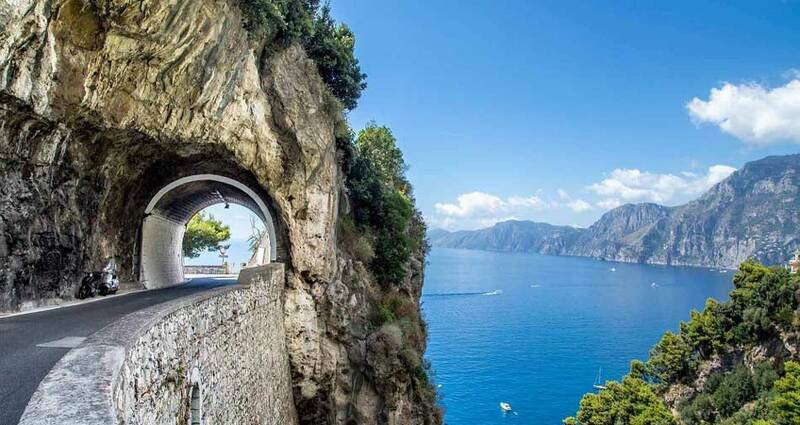 This is a 7 day motorcycle tour to Southern Italy and the Amalfi Coast. We ride from Rome to the Amalfi coast, then across the south of Italy to the Adriatic sea and back to Rome. Enjoy the views of these amazing coastlines and the scenery of the deep Italian south. Matera, Basilicata and Apulia offer fantastic scenery and outstanding food. This is a very compact tour of what Southern Italy can offer, but intensely great! Day 1: We set off from Rome early on a Sunday morning whilst the eternal city is still sleeping or having its early cappuccino. We'll head over the Castelli Romani and its volcanic lakes then ride the hills of ciociaria (southern Lazio) before reaching Sperlonga for our first night. Day 2: We head directly to visit Pompei in the morning and leave the afternoon to visit Positano and Ravello before reaching Amalfi for our overnight stop. 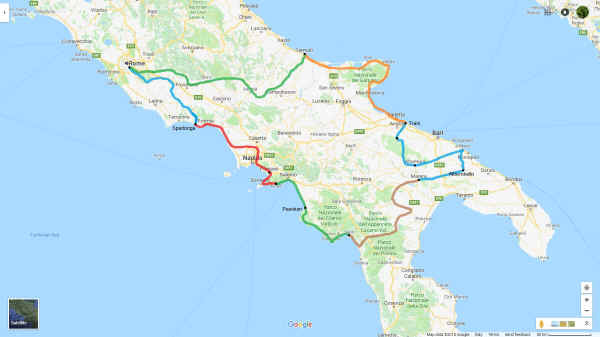 Day 3: We exit the Amalfi coast all the way to Salerno and keep going south along the coast viewing the Greek temples in Paestum and the magnificent coast road from Palinuro to Sapri. Day 4: From the coast we head inland across the mountains of Basilicata. We explore the ghost town of Craco and ride through the Small Dolomites of Lucania before reaching Matera where we shall sleep amongst the UNESCO site of the Sassi of Matera, ancient dwellings carved in the limestone. An incredible setting. Day 5: From Matera we ride to Alberobello, the town of the cone shaped houses known as Trulli, and from there head for the coast to the town of Polignano a Mare for lunch. In the afternoon our itinerary will take us across the Murgia region to visit the octagonal castle of Castel del Monte, before ending our day in the sea town of Trani with its white marble cathedral by the sea. Day 6: We ride north along the Adriatic coast and explore the spur of Italy's boot, the Gargano peninsula. Many curves, incredible coastlines and an ancient forest, called the Foresta Umbra (umbra = dark). Lunch in Vieste and final destination Termoli in Molise, the small region of Italy no one (even Italians) ever remembers. Day 7: Time to head back to Rome across Molise and southern Lazio. Rolling hills and relaxing scenery before reaching our starting point in Rome. Farewell dinner and arrivederci to the next adventure. Only for a small group of riders: 10 people minimum - 14 people maximum.